London, situated along the River Thames to the North Sea, stretches along the tidal river winding through central London with her many wharves, docks, and terminals. With incremental increases over the course of its long history, the port now handles cruise liners, ferries, and all types of cargo. London, the United Kingdom's capital, and largest city is also considered one of the greatest in the world. She is the political, cultural, financial, and industrial center of the former British Empire. Greater London is home to approximately 8.8 million people. The climate of London is considered temperate, with modest daily high temperatures during summer, and winter lows that seldom fall below freezing. Rainfall is fairly common throughout the year. June through September provide the most favorable weather with July being the warmest. Average daily temperatures range from 2.1C (35.8F) in February to 23.6C (74.5F). Dating back to 43 A.D., archaeology suggests the first real village existed, founded by the Romans. The Spanish also played a big part in London's history. During the 18th century trade had more than doubled and by the start of the 19th century, London had become the world's largest city. Containerization in the 1960's helped to make London the largest port in the United Kingdom and second largest in the world. London is the starting and ending city for many guests traveling out of Southampton on cruise ships as well as a popular vacation destination in itself. Today, London is the capital and most populous city in the United Kingdom. As a global leader in the arts, commerce, education, entertainment, fashion, finance, healthcare, media, professional services, research and development, tourism and transportation, it has an incredibly diverse range of people and cultures where over 300 languages are spoken in the region. It would be virtually impossible to experience all this city has to offer in a day, or even a week, as there is so much diversity in attractions. Sightseeing will take you to some of the most iconic London attractions. The Tower of London, Buckingham Palace, Westminster Abbey, St Paul's Cathedral and Trafalgar Square are just some of the gems you will have to explore. If museums are your thing, you do not want to miss Madame Tussauds London, British Museum, or the Natural History Museum. Some of the more modern twists include The Warner Brothers Studio Tour, Coca-Cola London Eye, The View from The Shard, or Shrek's Adventure London. If a relaxing stroll sipping tea along the Thames is more your style or a world-class pint of beer, you can stop into any one of the thousands of pubs such as The Mayflower, Grenadier, or The Carpenters Arms. If you are looking for an order of traditional British fish and chips or shepherd's pie anyone on the streets will point you to their favorite. If you desire something a little different you may want to try The Ledbury, featuring fine wines in a smart atmosphere, Gymkhana featuring tastes of the Tandoor, Barrafina, serving up delicious tapas, or Dinner by Heston Blumenthal delivering delectable delights in an elegant, contemporary dining room in an opulent hotel setting. While the city of London provides a vast array of quality attractions, opportunities to extend your visit beyond the city will present some of the historic charm of the United Kingdom. Day trips to Stonehenge, Bath, Oxford, and Windsor Castle are all available for you to enjoy. London will provide a plethora of opportunities to be entertained, explore, wine, and dine. Take some time to make a plan so you are not overwhelmed by the thousands of great choices. Cheerio! Round routes in London with on/off privileges for 24 hours or 48 hours! Comfortable double-decker city shore excursion buses! Easy to use system map of London! Audio narration on the bus - available in 11 languages! 6 different routes to choose from! 80+ Bus stops at the must-see sites! Complimentary walking and cruise tours available! 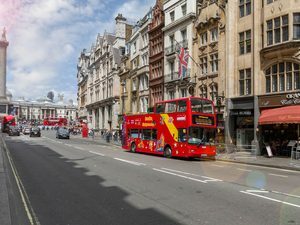 Explore the exciting city of London on an iconic double-decker sightseeing bus. The best way to see the sights is this Southampton Excursion with a great view from the top deck. Marvel at famous sites such as Buckingham Palace, Piccadilly Circus, and Trafalgar Square, and these can be seen on just on one of the 7 routes to choose from. See the best of this historical city. Great option if you are sailing out of Southampton.